The classic engagement ring is composed of two parts: a diamond and a setting. We understand that buying an engagement ring is a purchase that will last a lifetime and that a woman focuses primarily on her ring and less on the diamond itself. But we believe that your value is assured by making sure that you don't let the cost of the ring overwhelm your total budget. In the long run, the most retained value you will have is in your diamond. 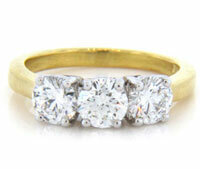 A ring can always be upgraded but a good quality diamond will stand the test of time and not depreciate. So always look for the proper balance within your budget between getting the best diamond you can and the ring. You won't be sorry. How Much Should I Spend when Buying an Engagement Ring? This is an emotional event that changes a persons life. The two-months salary convention is a common starting point. But we believe that you shouldn't spend more than you can comfortably afford, even if it is less than the "conventional wisdom." Regardless of the amount of your budget, your most important considerations should be quality and value. This guide will help you choose an engagement ring setting she'll love, and decide on the right combination of diamond size and quality, so you're sure to choose the perfect ring. Feel free to start by selecting a diamond. You can always find the right setting, but the diamond is where you will spend most of your money so look for the right diamond first. At A. Fishman & Son, we want to ensure that every one of our customers makes a knowledgeable purchase. Whether you want the largest diamond, the highest-quality diamond, or a balance of diamond size and quality, we'll make sure you have a full understanding of what you're buying so you're sure to make the right decision. Discovering what kind of ring she likes can be a challenge if you want to keep your proposal a secret. We'll give you a list of all the points you'll need to know before you begin shopping as well as some secret methods for discovering her ring size as well as her taste in engagement rings. When making this purchase, there are certain benefits you should expect as a customer. Learn what to look for, and you'll be sure to choose the right jeweler.